This spring Axalta Coating Systems (NYSE:AXTA) , one of the leading global suppliers of liquid and powder coatings, has once again produced a special coating for the radio telescope in Effelsberg, Germany, one of the largest, fully-steerable radio telescopes in the world, and the most powerful for short-wave radiation. The Effelsberg telescope is used to observe pulsars, cold gas and dust clusters, star formations, jets of matter emitted by black holes, and the nuclei of far-off galaxies. It is also used as part of a worldwide network of radio telescopes for astronomic observations at the highest resolutions. Axalta helps to protect the telescope from weathering and UV radiation with a matte-white polyvinylic coating called PercoTop(R) CS551 Foliflex Topcoat. This specially-formulated, tailor-made coating has been applied to the telescope approximately every 18 years since it began operating in 1972. Painting the telescope takes a minimum of six specially trained painters several weeks. “With a surface of 5400m2 and with 1500 individual panels, the portion of the dish that needs to be coated is immense,” says Klaus Bruns from the Max Planck Institute for Radio Astronomy, who is responsible for the technical maintenance of the Effelsberg telescope. The coating is applied with rollers, with no primer, after sanding the surface of the telescope using large disc sanders with a diameter of around 20cm. The large sanders, which resemble vacuum cleaners, allow the painters to sand and collect the dust generated simultaneously. 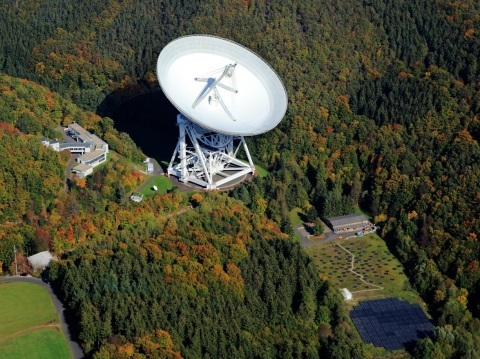 The work will be completed in summer 2015, and the Effelsberg radio telescope will continue delivering accurate measurements while being protected with Axalta’s PercoTop CS551 Foliflex Topcoat. Axalta is a leading global company focused solely on coatings and providing customers with innovative, colourful, beautiful and sustainable solutions. From light OEM vehicles, commercial vehicles and refinish applications to electric motors, buildings and pipelines, our coatings are designed to prevent corrosion, increase productivity and enable the materials we coat to last longer. With more than 145 years of experience in the coatings industry, the over 12,000 people of Axalta continue to find ways to serve our more than 120,000 customers in 130 countries better every day with the finest coatings, application systems and technology. For more information visit axaltacoatingsystems.com and follow us @axalta on Twitter.